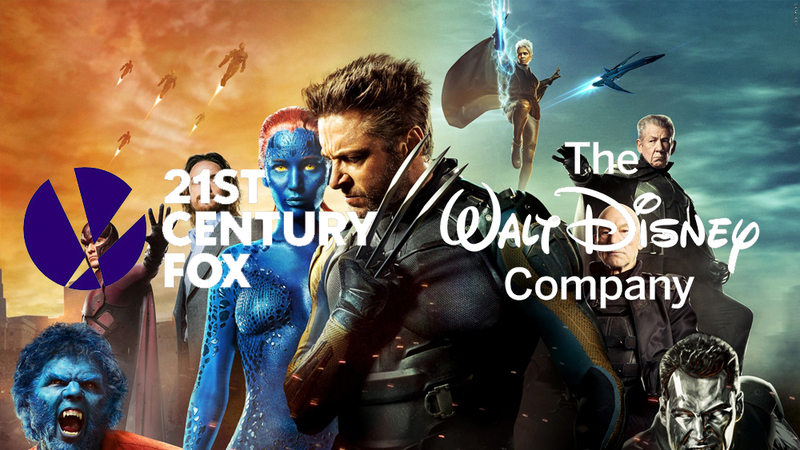 This week news broke that Disney was in talks to buy 21st Century Fox, or more specifically their film and television branch. Apparently, Fox wants to concentrate on news and sports, making the rest expendable. If this deal were to go through the ramifications would be felt in every corner of the entertainment industry. Last year, between the two companies, they controlled about 39% of the box office market share; the consolidation of two major movie studios is no small thing. That’s without even mentioning the television side, which would bring National Geographic, FX/FXX and more under the Disney umbrella. Needless to say, this is huge news, but there’s one aspect of the deal that intrigues me most; the potential return of The Fantastic Four and, more importantly, The X-Men film rights to Marvel. Years before being acquired by Disney, Marvel Comics sold off the film rights to some of their most prominent properties. It was in an effort to keep the company afloat during some tough financial times. The X-Men and The Fantastic Four (FF) went to Fox, Spider-Man to Sony, The Hulk to Universal, etc. and by most accounts, these deals helped save the company. Over the years some of their minor characters have reverted to Marvel, but the A-listers like the X-Men, remain firmly entrenched at Fox. It’s these rights deals that prevent Wolverine from appearing in The Avengers for instance. Just to be clear, we’re talking about some pretty big names here; Fox owns The X-Men and that alone includes hundreds of different mutants, most notably Wolverine, but also Deadpool. The FF and co. are no slouches either as they also include The Silver Surfer and Galactus. So with the possibility that these characters might finally be coming home, how would this massive deal affect the Marvel Cinematic Universe (MCU) and the ongoing X-Men film franchise? The most obvious and probably the most likely outcome of all of this would be the integration of The X-Men and FF into the MCU. It’s a mixed bag for me though. On the one hand, I think it’s probably extremely healthy for The FF, who desperately need some resuscitation. Marvel Studios has proven that they have the chops to give characters their due. They embrace what made them great on the comic pages and consistently cast the perfect actors to embody them. On the other hand, if you had asked me if I wanted to see the X-Men in the MCU even one year ago I would have said yes, unequivocally, but now I’m not so sure. The X-Men is an entirely different animal and a franchise that seems to be hitting their stride over the last couple years. We’ve been getting X-Men movies for almost two decades, and although it was starting to get stale, between Deadpool, Logan and even Legion on FX, the franchise seems to have found itself again. I’m not sure I want or need Marvel Studios to derail that progress. Fox has crafted a legacy around The X-men; built up over 17 years of movies. It was this legacy that gave birth to the masterpiece that is Logan. It wouldn’t be as powerful of a film without it. Even Deadpool builds off that history to some extent. So it’s somewhat of a trade-off; you cash in that history for a fresh start and the novelty of seeing Wolverine interact with Spider-Man. Is that the right move from a creative perspective though? I mean, sure, you could argue that now might be the perfect time to cut loose from those years of baggage, especially now that we’ve likely seen the last of the original X-Men cast on the screen. I might even agree with that. However, there’s also the possibility that Fox has only just now figured out how to leverage their legacy to craft movies that aren’t beholden to strict timelines or teasing the next instalment and instead lean into strong characters and story. If that’s the case, I want to give them a chance to explore that further. I also worry about the possibility of over-stuffing the MCU. As it stands now, pre-Infinity War, the size of the cast of the MCU is already a little unruly. It wouldn’t be too tough to bring in The FF, it’s only four characters after-all, and Galactus might even be able to provide the next Thanos level villain after he’s undoubtedly defeated. The X-Men, again, are a different story though. The MCU already has the Inhumans, the low-rent version of mutants, which in and of itself is a little redundant. And what about the big names like Professor X, Magneto and Wolverine? How do you find a way to introduce them into an established world without it feeling contrived? Even in the comics The X-Men and the Avengers feel very separate, so from a story perspective what do either teams gain from existing in the same cinematic universe? The X-Men are rich with story potential that has yet to be tapped on screen, and I don’t think airdropping them into the MCU is necessarily the best way of extracting those creative juices. That being said, those same rich stories could also be beautifully rendered at Marvel Studios if given to the right creators. Marvel has been criticized in the past for hiring great creative minds only to hamstring them by trying to force their round peg into a square hole. For better or worse their movies are all pretty similar. It’s a homogenized tone that works well for most of their characters. I would argue though that it doesn’t work as well for all of them and it’s not hard to imagine an X-Men movie that struggles to tackle complex ideas and still fit into that MCU mould. There have been a few deviations, of course, most recently being The Taika Waititi directed Thor: Ragnarok. It premiered over the weekend, and Taika’s uniquely breezy tone definitely shone through. However, Taika’s tone is also quite similar to James Gunn’s Guardians of the Galaxy (GotG). What if instead of being a sign of a new creator-driven MCU, Thor: Ragnarok is just one of the first films in a NEW Marvel mould - one that looks a lot more like GotG. It’s too early to know for sure, but I can tell you that as much as I love Taika Waititi’s work, I don’t think I want a core X-Men movie in that vein (Obviously Deadpool is the exception to that. I’d LOVE a Taika Deadpool). In my opinion, the best thing for The X-Men right now is to let Fox continue to explore this X-Men renaissance. Match great creative talent with great actors to tell the best possible stories without the confines of a cinematic universe. I want more movies like Logan, even if that means I won’t see Wolverine in The Avengers. Of course, this all speculative and Disney and Fox have yet to close a deal. A deal that would have significantly more ramifications than just “who owns which superhero?”. It is a fun thought experiment though. The crazy part is that as comic fans we had come to terms with the fact that The X-Men and The Avengers would likely remain separate years ago and I think we were mostly ok with that. Leave it to The House of Mouse to shakeup our entire sense of reality. Which is appropriate, because it would take a fundamental shift in the reality of the MCU to fit The X-Men into their plans. Check back to The Tower of Babble Blog every week for more of my written content touching on a variety of topics in the geek world.